Looking for a Saturday lunch spot? UPDATE: Feast is now closed. Saturday lunch: a notoriously hard table to find. Many better restaurants in New Orleans are dark on Saturday at noon, which is why I was happy to learn that the Warehouse District’s Feast (200 Julia Street, at Fulton; 504.304.6318) is open Mondays through Saturdays for lunch AND dinner. (Who knew? Not me.) 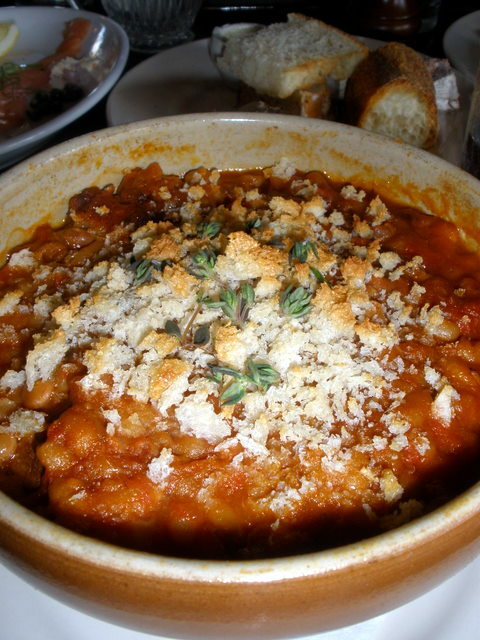 Pictured is a “pork and beans” cassoulet; it was rich and filling, and it would have been perfect for a damp, chilly day. Unfortunately, the heat index was 104. The meal’s star was the baked-in-house bread: thick crusted, very slightly sour, and substantial, it was the delicious antithesis of local French bread. I ended up at Feast thanks to erroneous information on UrbanSpoon, which claimed the restaurant would be closing soon. As Feast’s Houston opening generated much national press attention, I didn’t want the local branch to have come & gone without sampling a single meal. Have you been to Feast? What did you think? Oooh, a shot at local French bread . . . we used to get highly criticized for doing that! I didn’t mean to imply that French bread is NOT delicious….just that this particular bread was sturdy, thick-crusted, and slightly sour & dense (in a good way). I’ve been to Feast twice and both times been underwhelmed. I love the concept and am a big fan of any style of country food, but Feast seems to be going through the motions. On a recent Saturday night visit there was no one at the front door, no bartender behind the bar, and the manager was waiting tables. The food was average at best. The Snails on Toast was just barely that – eight snails in a drop of raw garlic butter on an untoasted slice of bread. For my $9 I want a little more than food dropped on a plate. Sorry to hear about your lackluster meal. With so many hospitable places in town, it’s always disappointing to have wasted money (and calories) on a sub-par experience.